These time switches provide automatic control for electric water heaters. They provide to-the-minute accuracy in programming and time keeping. The time switches can be programmed for repeat daily scheduling, 5-day working week scheduling, weekend scheduling or any individual day scheduling. Timers can be scheduled for operation during the lowest time-of-day rates or to switch off the electric heater during period of utilities peak power usage. The time switches can be set to operate for up to 6 ON/OFF operations daily for a maximum of 42 ON/OFF operations weekly. Both models provide a convenient external override switch and LED load indicator for ease in scheduling hot water as required for extra hot water demands. 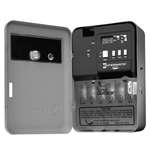 The timers include a “AA” alkaline battery carryover which protects both time keeping and program information for a minimum of 3 years. Switch Rating: 30 Amp Resistive or Inductive 120-240 VAC; 1 HP, 120 VAC; 11 ⁄2 HP, 240 VAC; 5 Amp Tungsten, 120-240 VAC.